The Plant Pathology Graduate Students Association (PPGSA) is composed of all currently enrolled graduate students in the Department of Plant Pathology. Graduate students of other disciplines and undergraduate students are welcome to join the PPGSA with full voting rights. Faculty, staff, alumni and other professionals can join PPGSA as non-voting associates or honorary members. 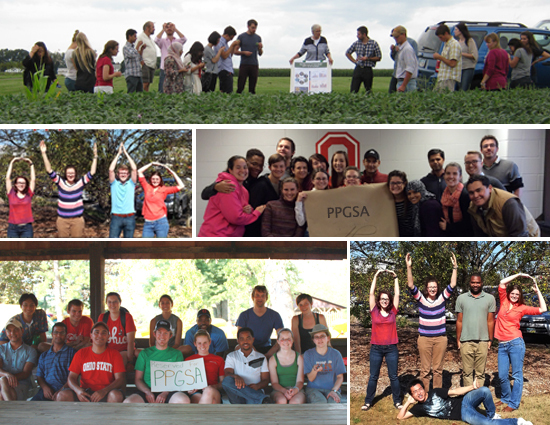 Active participation in PPGSA is a personal decision for each member. No dues are charged. Elections are held each Summer term with the new officers starting their terms at the beginning of Autumn Semester. Officers include President, Vice President, Treasurer, Secretary at Wooster, and Secretary at Columbus. A faculty advisor to PPGSA is selected by members of PPGSA at the beginning of each academic year to serve a one-year term, starting September 1, with appointment renewable annually. Representatives from the PPGSA serve as the official liaison between graduate students and the department. One representative located on the Columbus campus and one located on the Wooster campus are identified annually by members of PPGSA from among senior graduate students. Representatives are encouraged to participate in department meetings in a non-voting capacity, bring graduate student issues to the Chair, Associate Chair, faculty and senior staff, and communicate department policies and issues to the graduate student body. The Chair holds a meeting with PPGSA members at each location each semester.